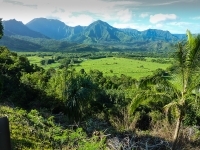 The wettest spot on earth is said to be Kauai's Mount Waialeale with an average rainfall of 485 inches per year - this has resulted in the Alakai Swamp, the highest swamp in the world, and the Waimea River, the longest river in the Hawaiian Islands. It also causes an abundance of rainbows and lush vegetation that has earned it the title of 'the Garden Island'. Kauai was the first of the Hawaiian Islands to be discovered by English explorer Captain James Cook in 1778 when he landed at Waimea on Kauai's southwest coast. There is evidence, however, that he was not the first European in Hawaii; some Spanish sailors may have paid a visit about a century earlier. Holidaymakers who opt for Kauai's raw wilderness are rewarded with some of the most secluded, pristine beaches in the Hawaiian Islands and marvellous natural wonders like Waimea Canyon, covering 14 miles (23km) on the west side. There are also some restored historic sites to explore, like the Alekoko Fishpond near Nawiliwili Harbour on the southeast coast, regarded as an engineering wonder of ancient times. We are looking for contributors for our Kauai travel guide. If you are a local, a regular traveller to Kauai or a travel professional with time to contribute and answer occasional forum questions, please contact us.